New College Muscle Beach is a Huge Success! On Friday 14th September Swindon Barbell took to the road once more, this time to run a Muscle Beach at the New College beach themed Fresher’s Fair! 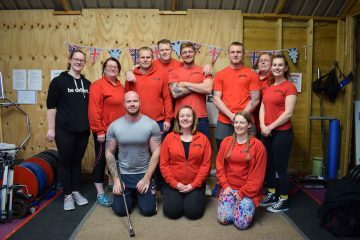 Students were encouraged to step up and try both Bench and Deadlift under the watchful eyes of Head Coach Charlie, Coach Helen, and members Mark, Emily, Kat and Knoxxy. 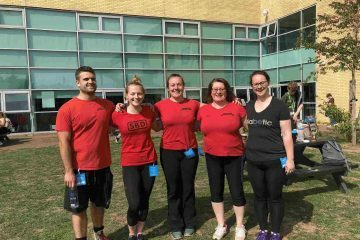 Joining them in this venture was Lucy, who though not a Swindon Barbell official member, has competed at several competitions in the last few years and was very keen to share some of her knowledge with the students. The day was a massive success, seeing huge numbers of students trying out the lifts, asking interesting questions, and showing some great form. 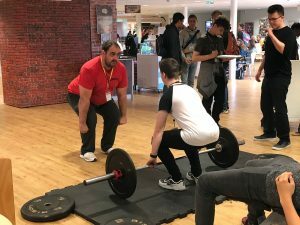 In all around 30 students tried out the lifts, with 23 signing up as interested in coming along to the upcoming New College Powerlifting club, which will be starting on 28th September and running until the new year. Many students who came and had a go had no experience in strength sports, and it was amazing to see how quickly they grasped the foundations of powerlifting in form and movement, there were several really promising new-comers who we are excited to see at both the New College club and perhaps at Swindon Barbell in the future. The most popular lift of the day was by far the bench press, seeing both boys and girls keen to test their strength and pit themselves against their friends. This inclination towards healthy competition is great and we hope that they will stay as enthusiastic about the sport in the coming weeks. 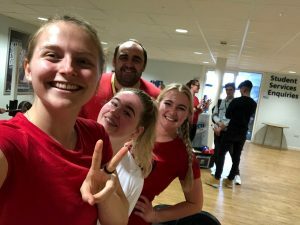 It was also particularly exciting to have so many 16-19 year old girls come to experience powerlifting and find themselves enjoying it as much as the boys. 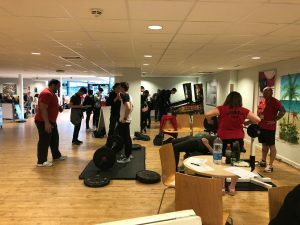 This year was one of the busiest taster days we have ever run at New College and the sheer enthusiasm of both the members in attendance and the students who were taking part brought in more and more people who wanted to give powerlifting a try. We hope that our numbers at New College can stay on the rise to bring more people into this great sport.